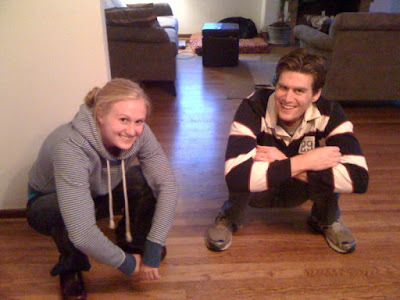 I was still too sore from the bike ride to want to bend my knees, but having gone to yoga class with Chris, I knew the "who can get the best squat position" was a competition I was going to lose. Eric came close.. Megan and I probably need to practice a bit before we can mount a significant challenge. PS: I forgot to mention: Eric now has his own blog. I've added it to our blogroll, at right. You have to get your feet flat on the floor otherwise you'll fall over. Which I doubt you want to do over a hole in the floor! Many people actually can't do this. Funny thing is Sam can already do this. He must be flexable like me because Frank can't do it!